Front-line protection that works as hard as your truck. If you want a beefy grille but you don’t want a lot of extra weight on your truck, then get the Cattleman Grille Guard. These guards are built to last with heavy gauge steel and fully-welded joints. 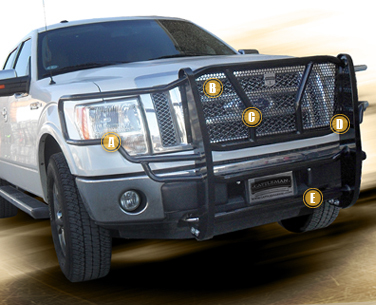 Cattleman series replacement grilles give the best possible protection for the front of your rig. Built with punch screen, and two vertical center support bars. It’s fitted design provides headlight protection, and it’s wrap-around diamond plate steel bumper completes the look and gives a custom feel. Stop at nothing; rule the road. 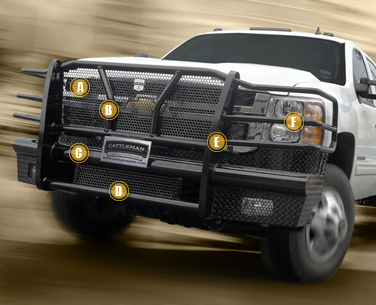 Cattleman Longhorn Series replacement grilles give the best possible protection for the front of your rig.